We’ve talked about bees, beekeeping and gardening for bees. Now let’s talk about the sweet reward for all that hard work – ours and the bees. Honey, sweet golden liquid of the gods, has been celebrated since its discovery so long ago that the story of that first encounter is lost in the mists of time. On this page we continue that celebration by sharing our favorite honey-based recipes. This is a delicious bread and it’s especially great for those of you who might not be able tolerate wheat in your diet. Spelt is an ancient grain that still contains gluten, so it’s not for anyone with strong wheat allergies. But if you’re on the less reactive side, this bread might be friendlier to your digestion. Yields two 8 1/2” x 4 1/2”x 2 1/2″ loaves. 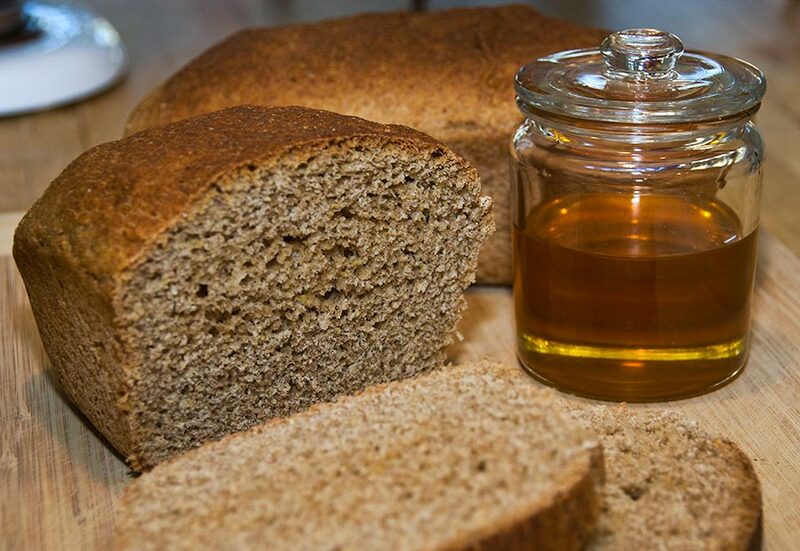 Combine yeast, warm water and honey in a warm bowl. Let stand until it proofs — yeast will begin to ferment and you will see the yeast swelling and some small bubbles in about 10 minutes. Meanwhile measure spelt, oat and corn flours into a large bowl and mix. Stir the melted butter into the proofed yeast and pour into a stand mixer bowl containing 3 cups of flour mixture and the salt. Stir until blended, then add remaining flour a cup or so at a time until it that is blended. Continue stirring for a minute or two. Dough will be a little wet. Turn dough out onto a lightly floured surface. Dip hands in flour to keep the dough from sticking and knead dough for 4 – 6 minutes, adding flour as necessary until dough becomes smooth and elastic. DO NOT over knead the dough – spelt loaves can get tough and crumbly if kneaded too long. Place the dough in a well-greased bowl, rolling it to coat the dough. Cover and let rise in a warm draft-free spot for about 2 hours or until doubled in bulk. Grease two 8 1/2” x 4 1/2” loaf pans. Make sure to really get them coated otherwise the bread has a tendency to stick. Uncover loaves and place pans in oven on a heavy baking sheet or a pizza stone and bake about 45 minutes until the tops are light brown and the loaves sound hollow when you tap them. Remove from oven. Brush tops with melted butter if you prefer a softer crust and turn bread out onto wire racks and let cool. Loaves should be cool before slicing. You can slice into a warm loaf, but it will be crumbly (and delicious if you slather it with butter!). The longer you wait, the cleaner the slices. Note: This bread freezes beautifully. I slice the second loaf and put it in the freezer for toasting. We like this recipe because you cook the apples with the skins on which gives the applesauce it’s pretty pink color — and probably a few more nutrients. Sterilize your jars, bring your canning pot to a boil and put your lids in a small pot to simmer. Place the apples, lemon juice and water in a large stock pot. Bring to a boil and cook over medium heat until the apples are soft. When apple are nearly done, add the spices and the honey. Cook for a few minutes more. If you want smooth applesauce and are using a food mill the skins will be left behind in the mill. For immersion blenders or if you want a chunky applesauce, remove the skins while the apples are cooking. Blend for a smooth sauce, or smash the cooked apples with a wooden spoon or potato masher for a chunkier sauce. After putting the apples through the mill or blending, return the applesauce to a boil and ladle into your prepared jars, leaving 1/2″ headspace. Remove air bubbles, wipe rims completely clean and put on the lids. Put jars into the hot water bath and process for 15 or 20 minutes — start timing when the water returns to a boil. If you’re at an altitude higher than 1,000 feet above sea level, process 2 extra minutes for each 1,000 feet of altitude. Remove from hot water bath and listen for the lovely “ping” of the lids as the jars cool and seal themselves. Leave the jars to cool for 24 hours. Wipe them to remove any sticky traces, remove the rings, and check the seal. Then label the jars and store them in a cool, dark place for up to one year. Wash, pit and quarter plums (or cut smaller depending on size of fruit). Place in large pan with sugar and raisins. Stir until sugar is dissolved. Do not add any water, the juices will release as the fruit heats up. Bring to a boil. Reduce to simmer, stirring frequently to prevent seizing. Be careful, the thicker the conserve gets, the more the danger of seizing. When it begins to thicken up, test with “quick cool test” for the right consistency. Put a couple of small saucers in the freezer. When the mixture seems thickened remove pan from heat, take a little of the liquid and put it on one of the cold saucers. Put this in the freezer for about 3 minutes. Take it out and pull your finger through the liquid. The sides of the divided puddle should move very slowly back towards each other. This test gives you a pretty good idea of how the final product will be. You may have to put the pan back on to boil and repeat this a couple of times to get to the right consistency. When properly thickened stir in lemon juice and walnuts. Ladle into hot, sterilized jars and process 10 minutes adding 2 minutes for every 1,000 feet above sea level. Makes approx. 9 – 10 half pints. In a medium saucepan, combine the honey and water and bring to a boil. Bring a canning pot or large stock pot to a boil. Put your lids into a small saucepan and bring to a simmer. 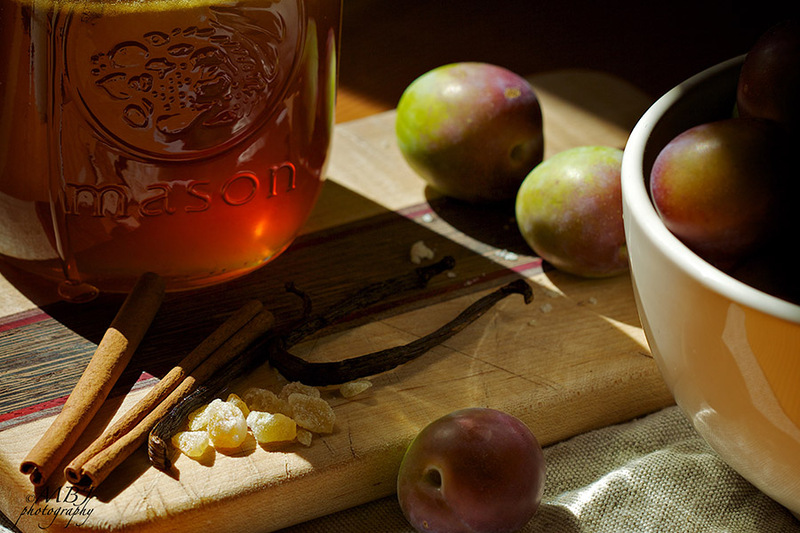 Clean canning jars and pack the plums in as tightly as you can. Insert your cinnamon stick, vanilla bean or star anise. Fill jars with honey syrup, leaving 1/2 inch of headspace. When processing time is up, remove the jars to a cutting board or towel-lined countertop (as they cool and seal, they might spit out a bit of sticky syrup, so don’t let them cool on any surface that can’t handle that). Let the jars cool undisturbed for 24 hours. When jars are completely cool, remove the rings, check the seals and wipe the jars down to remove any sticky residue. Label and store in a cool, dark place for up to a year. *I tweaked the recipe by adding crystallized ginger to a few jar. I added cardamom to another jar. You can probably think of other good flavorings to try. B: I love rhubarb, berries and cornbread, so when I saw the recipe for Rhubarb Raspberry Cobbler with Cornmeal Biscuits by Melissa Clark in The New York Times back in June I filed it away in my overflowing “recipes to try” file. With the season about to come to an end for both rhubarb and strawberries, I thought it high time to give this recipe a whirl. The finished cobbler was delicious. I hope you enjoy it as much as I did. Preheat oven to 325 degrees. For filling mix together honey and cornstarch until blended and then stir in the rhubarb until mixed. Gently fold in the strawberries. Let mixture stand while preparing the biscuits. Add butter and pulse until mixture resembles a coarse meal (or use 2 knives to cut butter into flour mixture). Pour in milk and continue pulsing until dough starts to come together, scraping sides if necessary. Turn dough onto a lightly floured surface and gently pat it into eight balls. Flatten the dough balls slightly into thick rounds. Scrape filling and juices into a 2 1/2 quart baking dish (9″ x 12″). Arrange biscuits on top of fruit filling. Bake for 40 – 45 minutes, or until filling is bubbling and biscuits are golden. Yields 8 servings. These tips for baking with honey come from Mark Bittman’s How to Cook Everything Vegetarian. Honey is about 25% sweeter than conventional sugar, so use less of it when you’re substituting it. Mark reports that cookies tend to spread more when made with honey, so you’ll have to experiment a little bit. Other suggestions he makes are reducing the liquid by 1/4 cup for each 1 cup of honey, adding 1/2 teaspoon of baking soda to balance the honey’s acidity, and reducing the oven tem[erature of quick breads, cookies, and cakes by 25 degrees to prevent overbrowning. P.S. If you are looking for a great recipe for Banana Tea Bread that uses honey instead of sugar, check out my daughter’s website: foodbykristin. B: Some years ago I was inspired to create what I called Strawberry Bliss to top an angel food cake I’d made for my father-in-law’s birthday. Herman was a man besotted with strawberries. And this simple, but spectacular sauce is as close as you can get to pure essence of strawberry. I was prompted to dig way back into my recipe book by a Smitten Kitchen recipe for cream cheese pound cake and strawberry coulis. When I first created my version of the sauce, I had no idea that the proper term for it was coulis, a thick pureed sauce made from fruit or vegetables. Live and learn. Put quartered strawberries into food processor. Puree while adding honey (more or less to taste, depending on ripeness of berries) and liqueur. You may need to add a little bit of water to smooth out the sauce. Refrigerate before serving. Can be made one day ahead. Cool! Can’t wait to hear about some great honey based recipes!